The Light Blues had scored in the opening ten minutes of the previous three fixtures, but there would be no such early release of tension for the Ibrox crowd against a stubborn Hearts side. It would take late goals in each half from Andrius Velicka in first half injury time and Kris Boyd’s 30th of the season in the 89th minute to finally break Hearts’ stubborn resistance. Boyd and Velicka had been getting little joy from their aerial battle with Marius Zaliukas and Christos Karipidis and their midfield seemed to lack the killer touch to offer the front pair a clear cut chance. The best of the first half fell to Boyd just two minutes before the opener when a poor clearance from Marian Kello fell to Velicka and he played his partner in. The 100 goal hitman looked to have notched number 101 as he lifted the ball over the advancing Hearts keeper only to see it rattle the top of the visitors’ bar. But just as it looked set to go in level at the break the pair combined again to find the opener. Velicka won a corner on the right and Stevie Smith’s wicked delivery found the head of Boyd who nodded back across goal for Velicka to drill home against his former club. It was Velicka’s fourth goal in as many games and with Kenny Miller, Nacho Novo and Kyle Lafferty all lurking on the sideline it would have been a welcome one for the Lithuanian after a relatively quiet first 45 minutes. The opening half was notable for a lack of real openings for either side and punctuated only by yellow cards to Smith, for a lunge on Eggert Jonsson on the half way line, and for Michael Stewart after a similar challenge on Pedro Mendes. Velicka’s late goal bought him less than ten minutes of the second period with Miller the man to replace him for the second match in a row just a minute after Hearts had introduced Christian Nade for Mike Tullberg. At that stage the home side could have been two in front after Boyd’s strong challenge earned him the space to play in Steven Davis down the right only for the midfielder to scuff his shot from an angle as he broke in to the box. The Ulsterman had another fine chance to add to the advantage after 64 minutes but not before Rangers had suffered a scare at the other end. 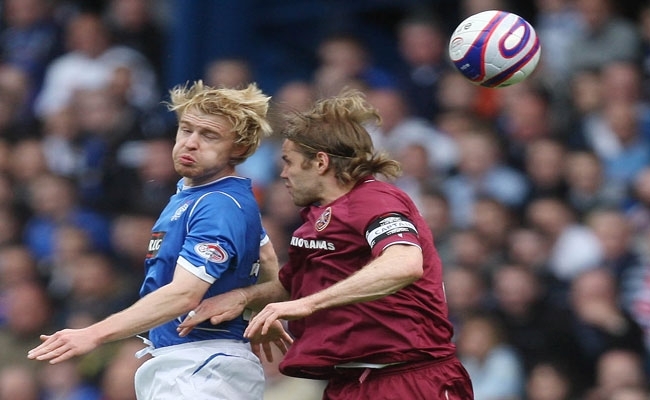 With Mo Edu robbed of the ball and looking for a foul in the middle of the park Calum Elliot broke in to the Gers area and went down under the challenge of Steven Whittaker. Referee Iain Brines waved away the visitors’ appeals to the relief of the Ibrox home support and within minutes was reaching for his card for the third time. With Rangers breaking Robbie Neilson clattered in to Smith on the halfway line, but with the crowd crying for an ordering off, a yellow flashed again. The incident was all but forgotten within moments as Davis was fed through by Mendes for his second chance of the half. Moving in from his spot on the right he burst through the middle to collect Mendes’ pass but couldn’t get it under control in time to work an angle as Kello came rushing from his line to force a corner. From Smith’s delivery again Rangers won the aerial battle, but McCulloch’s header flew high over the bar. 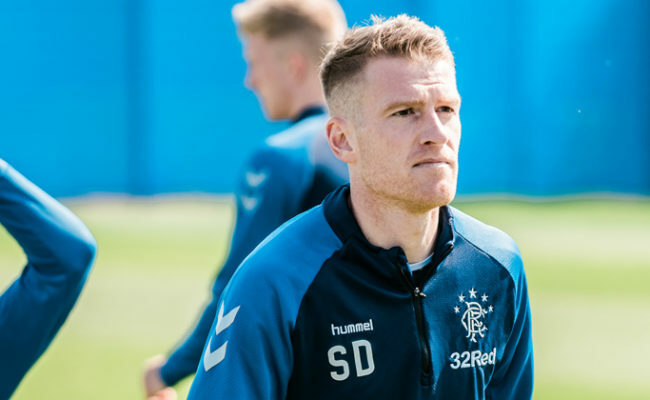 That set piece would prove to be Smith’s last meaningful contribution as he was soon replaced by Lafferty – making his first appearance since suffering an ankle injury against the same opponents at Ibrox in March. 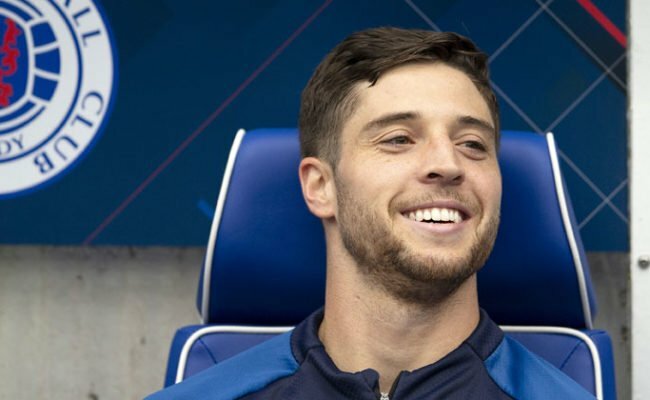 The Northern Ireland forward almost made an immediate impact when his lung bursting run down the left allowed him to slot a ball through for Boyd, but just as the No.9 had his sights on goal 101 he was denied by a linesman’s flag. 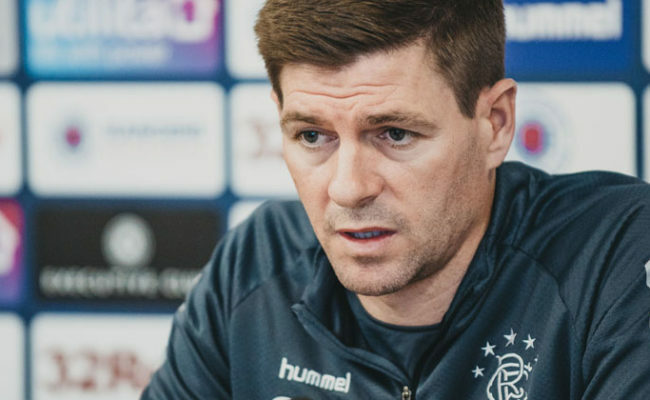 With the three points still in the balance the nerves were evident as Rangers slipped deeper and deeper. Sensing the chance of a repeat of March’s comeback to claim a point Hearts introduced Laryea Kingston for David Obua, with Driver switching back to the left. The talented midfielder was quickly switching back though to fire in a dangerous free kick after Weir had fouled Elliot. With several Hearts players lurking in the middle Alexander was glad to see the ball slide by his far post. But that sense of relief was nothing in comparison to the wave that swept round Ibrox with the sight of Boyd’s 30th goal of the season hitting the back on the net. Davis’ progress through the middle seemed to have been halted, but he picked out Miller on the right and when he fired it across goal on the six yard line Boyd was again in the right place at the right time to capitalise and set up a thrilling Old Firm derby in six days’ time.